Google this man, Plato’s Cave ! What’s reallyt changed from spears to guns? Your can hear the song on this site. Thanks! Invisible Man Continued: The Boomerang of History and The Agenda of Deception Revealed Through Gematria, Did Ellison Change His Birth Year To Sync Numerology to Novel? in the film. Pinky ring 60/123, like Conspiracy 60/123. Cigar and pinky ring = 99. You can find the video at YouTube. 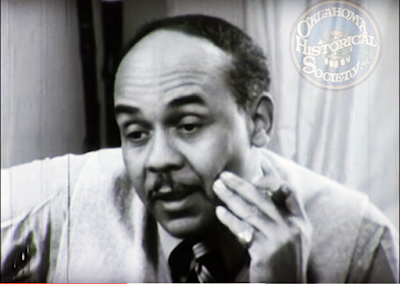 In my first post on this topic, here, I made a mistake in the calculation of Ralph Ellison’s birth numerology. He was born on March 1, 1913 and not March 1, 1914. He was actually born in 1913, but there’s a good reason why I made the mistake. 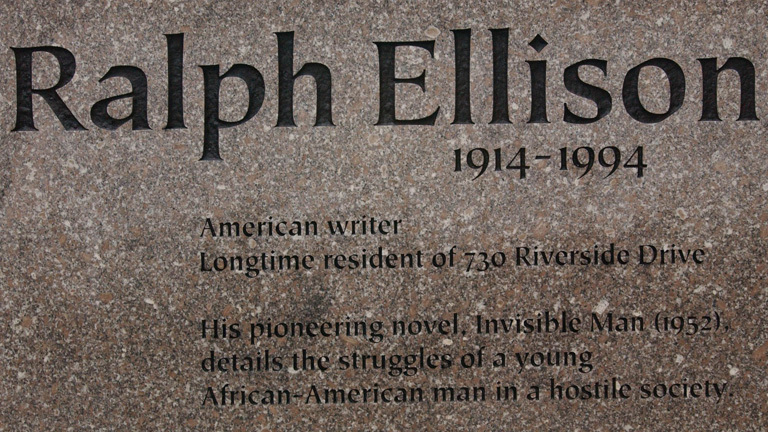 Ralph Ellison changed his birth year the from 1913 to 1914, himself. So, even though I made a mistake, it it was based accurately on an alteration that Ellison made on his own. I’m still researching what Ellison’s stated motivation for the change, but since I exposed the relationship between his 1914 birth numerology, the novel and its gematria coding, my findings still stand. This move of Ellison’s adds support to the idea that the real reason for changing his birth year to 1914 was to make all the 37 coding in the novel, sync up with his birth numerology. That may seem outrageously far-fetched to some. However, the more one looks into celebrities and their gematria and numerology, the more one sees this pattern of changing names and dates to fit predetermined numerical patterns. In Ellison’s case, with so much hinging on how 37 is used in Invisible Man, especially in the Prologue, there really is no denying at least the possibility of this kind of thing. I have an article about that here. So let’s resume this study with Ellison’s death numerology. When you break apart all the date April 16, 1994 into single digits you come up with 34. 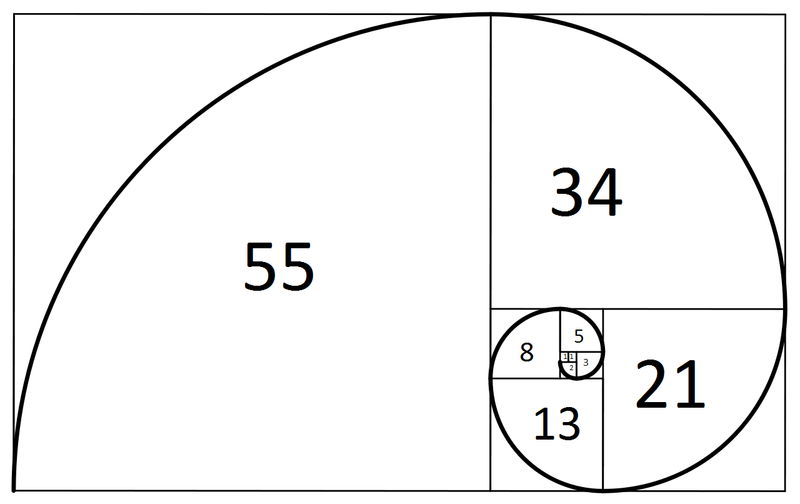 Fibonacci numbers. 1+1=2, 1+2=3, 2+3=5. 5+8=13 and so on. 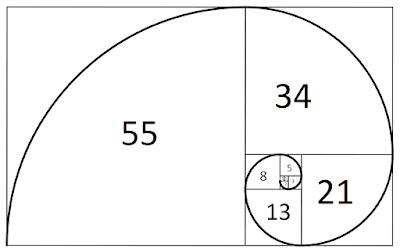 34 is the ninth Fibonacci number, a famous mathematical sequence that explains the development of natural processes. Sometimes even death is a natural process, but when murder by the numbers comes into the picture there’s nothing natural about it. All of the syncs with dates and other numbers show a pattern of synthetic manipulation, not by divine will or chance, but by human intervention. For instance, the word “nine” also adds up to 42 in simple gematria, which ties back into the symbolism explained earlier in this post. From what I’ve found about how the elite uses gematria, stacked numbers with tie-ins to other stacked number patterns are very common. The associations of other significant words that sum to 34 are what link it to the propaganda of chaos and crime.The book is still strong reading in time. Even though Ellison and Invisible preach nonviolence with their rhetoric, the emotional tone and gematria tell a different story. With so much data that links together in so many different ways, Ellison’s reported day of death on April 16, 1994 with completely natural case of pancreatic cancer is questionable. In this saga, Ellison seems to be at both ends of the gematria game, contriving names and numbers in his novels for his sponsors’ predictive propaganda as well as being on the receiving end of the equation at his demise. We can this in how he plumbs the depths of the dark energy of 34 through the character of Tod Clifton. Dejected and ready to die rather than live a life of compromise, he attacks a white policeman and is killed. But before that, Ellison strips Clifton of his dignity by having him sell Sambo dolls on the street, before the policeman asks for his peddler’s permit. That was the breaking point for Tod Clifton. He is the only character that’s killed in the novel and his gematria links up with many words and symbols that have to do with death and assassination. It’s also interesting that Clifton also locks with the gematria of Lincoln in both reduced and simple ordinal gematria. Clifton’s first name “Tod” also evokes Lincoln’s wife Mary Todd Lincoln. I think it’s also interesting that Ellison dropped the final “d” on the usual spelling of “T’odd.” One does see the name spelled both ways but “Todd” is most common. Given the context and the gematria, that’s probably not a coincidence, as is evident on the table to the right and how it matches up with the gematria of Tod Clifton’s entire name. It’s also somewhat strange that Clifton is only one letter off from Clinton, as in Bill and Hillary Clinton. However, that could be just one of those things. I think it’s important to remember that Tod Clifton was a community organizer. Obama is said to have gotten his start in Chicago doing the same thing. Here are more words that add up to 34 and that have painful and destructive connotations through gematria and their standard definitions. The three preceding words have strongly negatively emotional content on their own but these next two have some other things happening. 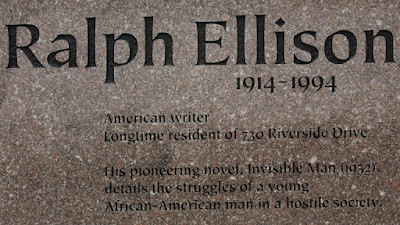 Ralph Ellison memorial in Harlem. It was the first racial protest song by an Afro-American ever to be released nationwide Black and blue is also color symbolism for the police forces that defend above all else, the status quo of wealth and power. The date of the recording by Armstrong was on July 22, 1929. That’s 7/22, a number combination that relates to Pi, since 7 into 22 is approximately 3.14. Pi is a symbol of things coming full circle, like life and death. African-American man in a hostile society. When I noticed that the year (1952) was on the epitaph, in parenthesis no less, I realized it was probably part of the coding as well. When you decode 1952 by writing it out, and adding using reduced gematria you get 84. 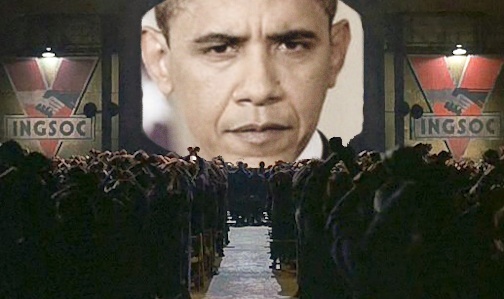 84 also brings in the obvious allusions to Orwell’s novel 1984. With these connections I think we can also see why the novel was given its title. The idea is not too far-fetched when one considers that the Zionist-Masonic network is international and spans history and national borders worldwide. I also think there’s something in the syncing between the publication dates of the two novels. 1984 was published June 8, 1949. Invisible Man was published April 14, 1949. 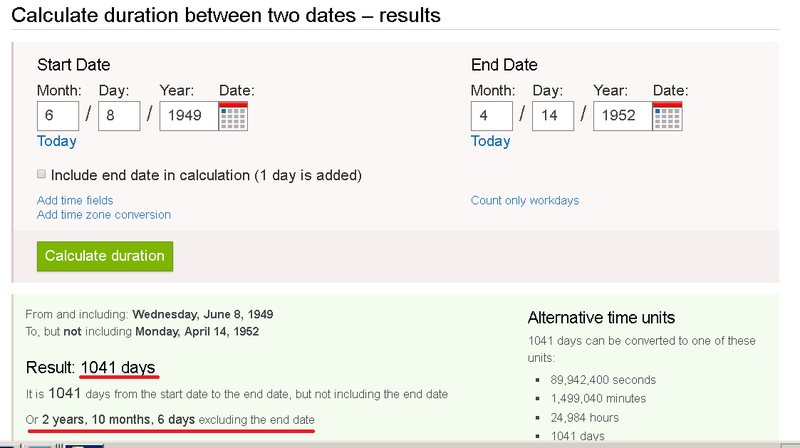 There is a span of 1,041 days or 2 years, 10 months and 6 days. In numerology, it’s customary to drop zeroes from calculations. With that in mind 1,041 syncs up with the Ralph Ellison’s gematria. And there’s even the added tie-in like I explained earlier with the 2-1-6 pattern from the years and months, when you drop the zero in 10 months. When focusing on 84, we have to consider the date 8/4, or August 4th, which is listed as Barack Obama’s birthday. That’s a solid connection when you consider that Obama openly acknowledges Invisible Man as being the inspiration and model for his book Dreams of My Father. In the next post, I’m going to explore the startling history that gematria reveals about that part of the story. Adding a bit more to the 84 connections. 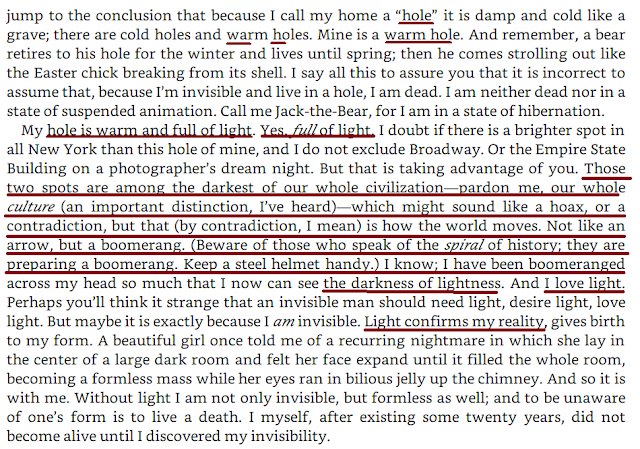 Invisible calls himself “Jack the Bear” for hibernating in his warm hole of a basement catacomb covered with 1,369 incandescent light bulbs. One more thing, during the Iran-Contra Contra hearings 1985-87, it leaked out that the U.S. Government had a continuity of government plan in place to suspend the constitution and install martial law in the event of a national emergency. This was to be provoked by racial unrest and riots. The inner cities first would come first, and then the rest of the country. FEMA was to be the directing body for a military dictatorship. The name of this operation was called Rex 84. So there you have it. In Ellison’s novel, Invisible tried to get the rioters to realize that their acts of violence and revenge would only give the police and military what they wanted in the first place. There’s a part of me that still wants to believe that this prophetic warning of Ellison’s was sincere. In any case, it comes true, history repeats every time riots and retaliation get out of hand. Rex 84 was the plan to take advantage of that situation. Here’s a few more eye-openers before moving on. When you consider that from Ellison’s death to the 9/11 attacks, there was a span of roughly seven years separating the two events. When you use gematria for “seven years,” you get 43 reduced and 133 simple ordinal. That’s an exact match with the other two possible ways to break down the numerology for Ellison’s date of death. 43 is the 14th prime number which ties back into the 4/14 date that is coded all over the Ellison/Lincoln connection. It’s also worth noting that 43 is a mirror reflection of 34 and its exploited to play on the baser emotions of human nature, as explained earlier. The gematria evokes the past while also providing subliminal coding for how the order-out-of -chaos, divide-and-conquer game has been playing out more and more in the real world. Civil War. Like all other modern wars, it was a banker’s war. The most significant thing concerning 43 that I’ve found so far is this, Civil War in the English Reduction system = 43. For the record, the American Civil War began at 4:30 AM on April 12, 1861. In 1952, when this book came out race riots, lynchings, rigged courts, police brutality, wide open prejudice, hate and violence were threatening to tear the country apart. The horrible death and destruction of the Civil War between North and South, the cruelty and injustice of slavery, the greed of bankers and financiers, the bigotry of the average Anglo-American seemed just as alive in 1952 as it had been in 1852. In 2016, the situation is much more confusing, at first glance. Real victories in terms of the American people at the street level, in their own lives, taking Martin Luther King’s advice, learning how to live together in harmony have occurred on a large scale. Yet, for all that, hostility and hatred is back on the rise. The more one looks into the facts, it becomes clear. All manner of conflicting groups are being pitted against each in the media, and this tactic follows a pattern well established in history. In order to rule, there has to be some manner of consent. To get the people’s consent, at least some of the rhetoric and policy from the top has to look and sound righteous and reasonable. The problem is that when enough people actually unite under a common cause inspired by a great speech by King or a movement fueled by new music, that’s also paradoxically threat to the predatory divide-and-conquer power structure that’s always existed in this world. In World History 101, everybody gets to hear about the Hegelian dialectic of the conflict between thesis and antithesis which eventually leads to a synthesis between the two. What we weren’t told is that in the grand experiment of the Zionists and High-level Masons, conflicts are artificially provoked through propaganda and staged events. Instead, we were told that it explained how politics and culture just naturally work, differences in opinion and perception just lead to conflict on their own, because that’s just the way it is. In the song by Bruce Hornsby we’re told not believe it. To support that here’s the gematria breakdown that breaks the cover. Because we have more in common with each than we realize, they seek to divide us. Because we are only beginning to rediscover what it means to be human, we’re lied to and provoked into hating each other. 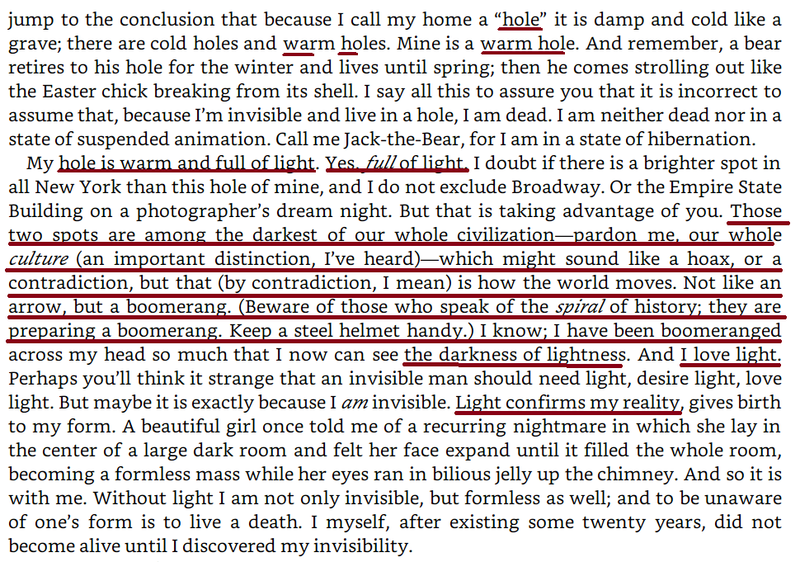 Recalling what Ellison’s writes in the Prologue, Invisible tells us that he is in hibernation, but unlike what most hibernation is like, Invisible refers to his hideout in the following manner. This screenshot is from Kindle edition of Invisible Man page 6. This is an unusual pose for a political endorsement. There’s something in this passage that tells me that Ellison is talking is forecasting an Afro-American occupant of the White House, way back in 1952, which I’ll get to in a moment. But for now, what makes this even more probable is how Barack Obama and Invisible Man have been conflated in the public eye. I’m including several images from magazine articles that bear this out. The most significant linkage between Obama and Invisible Man is the Esquire Magazine endorsement in 2008. 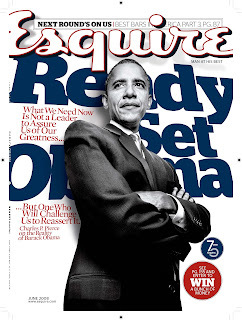 It was the first time in the magazine’s 75 year history to ever endorse a presidential candidate. 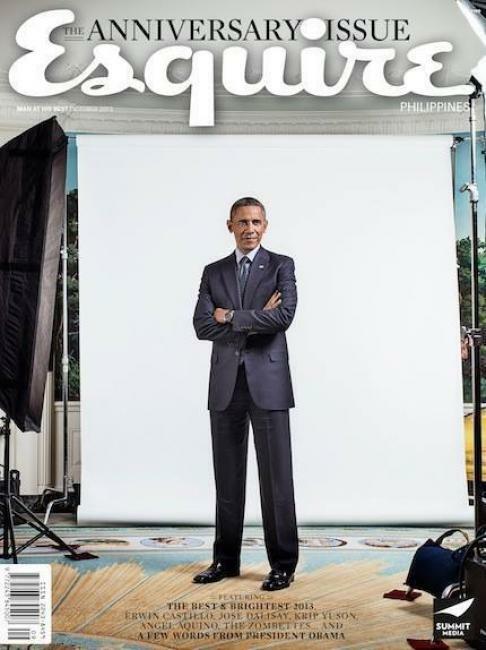 What makes that significant is that in the novel, Invisible imagines himself featured on the cover of Esquire (p. 164 Kindle Edition). Esquire first came out in 1933, a year containing 33, the most important number in Freemasonry. When Invisible Man was published in 1952, the magazine was 19 years old, another number deeply connected to Invisible Man’s gematria. I wrote about the importance of nineteen in this article. In the passage take from the novel above, Invisible warn us to beware of those who speak of the spiral of history. He tells us that instead of a spiral, history is a boomerang, and that we had best be ready with our helmets on. Considering that the gematria reveals the number 99, which is another way of saying 9×11 or 911, I think we can take Ellison on his numbers, so to speak. What about the boomerang? That oldest of Masonic tricks. That’s it, make em think that this time it’s gonna be different. This time, the ole’ boomerang’s gonna jump orbit and fly off into space all on its own. It ain’t never comin’ back! Look out! Here, I’m afraid I’m going to have to bring Hegel back into it the discussion because it was Hegel and later Marx who spoke of the spiral of history. The Hegelians thought of history as a spiral, caused the struggle of thesis and antithesis, explored earlier. I had not meant to get into a lot of this philosophy but when you discover that you’ve opened a whole nasty can of gematria, you have follow the numbers. So here goes! Hegel uses the term Aufheben, a word that has several contradictory meanings, “lift up,” “tear-down,” “abolish, “preserve,” “transcend,” to describe what happens in the interaction between thesis and antithesis. Sorta like the “Order out of Chaos” slogan that the Masons love to put on their medals. That’s because that’s what Aufheben is, the action of synthesis that takes place in the mind, in whole civilizations when opposing ideas or forces, both physical and spiritual vie for dominance in the world. How bout that. Two of the most traditional, respected and yet murderous and disruptive institutions known to history, reflected in the term Aufheben. It’s from one of the most influential philosophers of modern times, so I’m sure that’s a coincidence, too. In the English translation of Aufheben, sublation is the term that is used. There are also significant gematrical connections here, as well. It’s fitting that the English translation of the original German has a gematria of 32. America and UK both have gematria of 32. The 113 gematria can be seen as 11×3, or 33. That number is of course the highest acknowledged degree of Scottish Rite Freemasonry. 32 and 33 together are the two highest degrees. The sound and sense of the altered line still seem like something Ellison would write. I need to mention that in my other post here, I noted that 1,369, the number of lights that Invisible has strung up in his apartment, is the Jewish gematria for 1776.This word switching technique of code-breaking is more speculative than the others discussed, but I think Ellison may be dropping us an important clue with that connection. 139 is close to the 1,369 lights hanging from Invisible’s ceiling, just without the 6. The passage is from page 6 of the Vintage Edition. I don’t have the original but I’ll bet it’s the same. Anyway, seems like another possible clue. When I study these things, I try looking at a lot of different angles. The line is strongly evocative of Matthew 6:22-23 where it says. 22 The eye is the lamp of the body; so then if your eye is clear, your whole body will be full of light. 23 But if your eye is bad, your whole body will be full of darkness. If then the light that is in you is darkness, how great is the darkness! The verses breaking down to something like (6) 3+3: 22-23 is also interesting with the 322/223 symbolism there as well. I found that some of the other key phrases from passage above that have significant gematria. Divine Rule, Birthright, All Seeing Eye, and Star of David all have gematria of 119. Freemason, Three-Ring Circus both have gematria of 96. It’s like Ellison is shouting, “INCOMING! Aufheben! Boomerang 12 o’clock! Come to think of it, the more I find out about this book and Ellison, I’m almost inclined to believe that he put so much coded symbolism into Invisible Man for us to find at some point. He does say something about making the masters choke on their own validation–killin’ ’em with yeses, so to speak. Then again, it’s hard to say. There is the possibility that I’ve read way to much into all of these references, but then again maybe not. My hunch is that after Ellison wrote the manuscript, he and his editors worked on details like punctuation, grammar, and yes gematria. The gematria was encoded to help facilitate through subliminal propaganda the agenda of racial unrest and martial law outlined in Rex 84. 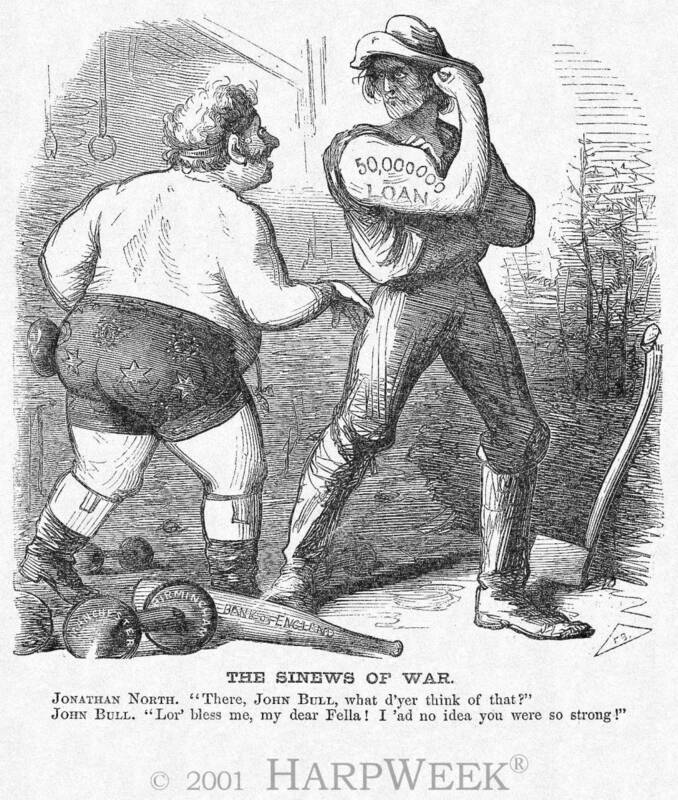 Ellison was rewarded with wealth, numerous honors and was also the first African-American admitted to the secretive and exclusive Century Association of New York People like Fabian socialist and education “reformer” John Dewey, public relations and propagandist Edward Bernays, Eisenhower, Henry Luce of the Time/Life Magazines, and far from least Aldous Huxley, the author of Brave New World. 63, of course another way to write out 6 6 6. It never ends but this post has to. For more about 223 and its other connections, check out these articles on Zach Hubbard’s blog. If you’d like to replicate the gematria calculations in this article for yourself, here the link to the calculator. When the number 51 comes into the picture, it often means conspiracy, intrigue and subversion. In this post, I’m going to show a few things that bear this out. First of all, the gematria for the word “conspiracy” in the English reduction method equals 51. Conspiracy also equals 123 in the English ordinal method, which is interesting right away with the way the number is like a count-off for a song or a race. 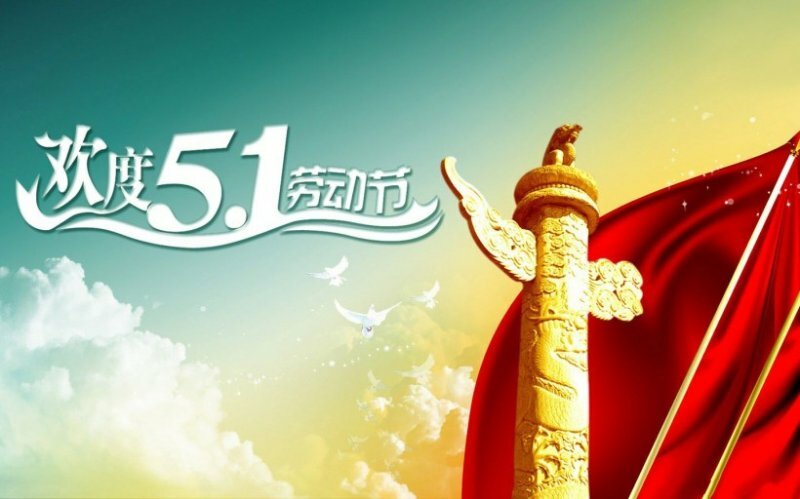 But for this article I want to focus on 51. When we think of conspiracy, the one name that comes most to mind is that of Adam Weishaupt, who led and, along with others, formed the Bavarian Illuminati. History tells us this occurred on May 1, 1776. That’s 5/1/1776. Not only that, Adam Weishaupt’s very name gives us an echo of this number. 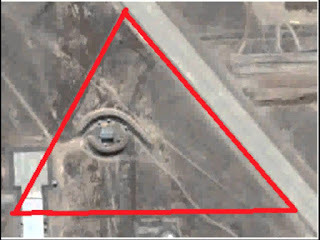 An installation at Area 51 from a Google maps image. As far as mathematics goes, 51 is a natural progression to 119 in the Perrin numbers matrix. Conspiracy and all the terms like divine rule and birthright, likewise, go together. How about things that go together that add up to 51? These are the lyrics of what is to be the world’s first music video based on gematria coded history. I’m going to use public domain newsreels and photos to expose how the past was rigged.